Hold on to your philosophical underpinnings and keep your dictionary close by as you venture off into Living in Space. This compilation of 21 short essays will tax your understanding of what it means to be human and will expand your socio-cultural horizons. Dr. Sherry Bell has brought together an amazing assemblage of techno-philosophers to probe the future of humanity as it moves into the realm of outer space. Each dissertation is presented as a chapter that covers a broad swath of psychological, philosophical, cultural, physiological, political and economic topics—there is something for everybody. To be perfectly honest, some of these issues were outside of my scope of interest and I actually gave-up on two chapters before I completed them. Nevertheless, the wealth of ideas presented is stimulating. The first 15 segments are classified as ‘non-fiction,’ while the next four are short fictional forays into the future. These are followed by a conclusion for both the fiction and non-fiction. Let me caution the reader: I found the first few chapters written far above the average reading level. The number of ponderous polysyllables made progress painful. The question must be asked “for whom is this book written?” My impression—for those of us who are space exploration enthusiasts who, with respect to this topic area, are interested in understanding some of the more philosophical foundations of long journeys into the cosmos. Unfortunately, some of the chapters are apparently written more to impress than to express. With some sentences more than 60 words long, it takes a real effort to understand what the author is trying to say. With those caveats, let us explore some of the content. The thought of physically ‘leaving’ Earth and the change in the psychological perspective are examined in some detail. These impressions were first observed by the Apollo 8 astronauts as they looked back on our small blue ball receding into the vast blackness of space. However, the scope of the Apollo 8 flight was well defined, with the Moon being a mere 240,000 miles and 3 days away. Space adventurers, who will embark on journeys to the planets or beyond the solar system, are bound to experience the full gamut of emotions. While this is what I expected from the title of the book, there is more. 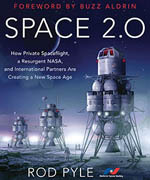 Chapter 3, “Overview Governance,” discusses administration models for space habitations (to include planetary bases). Statements are made that essentially propose that governing in space cannot be as it is on Earth—that the needs and environment demand a different approach. 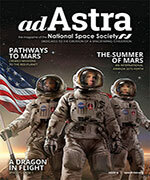 An attempt is made to assess ‘why’ we are projecting the human species into space. I found this chapter to be one of the most interesting. Other chapters addressed overcoming the various physiological conditions that we currently understand as debilitating (weightlessness and radiation for example) and the possibilities of genetic engineering and cyber-hybrids. I was surprised that no chapter discussed the elements of a fully self-contained life support system, although periodic reference was made. The chapter “On the Dominance of the Metasphere” asks, “What do we see as the ultimate goal for human consciousness in the cosmos beyond universe?” [sic]. Aside from the fact that you probably will not find the word ‘metasphere’ in your dictionary, this chapter makes the statement “we do not know what the human genome wishes to become.” This is not the only chapter that makes assumptions about the evolutionary process beyond the Darwinian presumption that evolution is a process driven by “random and purposeless mutation.” I therefore must assume that the author of this piece is asking the question rhetorically. However, projecting forward (and in the same paragraph) the author contends that with technology, “The relation between the robot and the human will become increasingly transparent.” Be prepared for these kinds of thought processes. 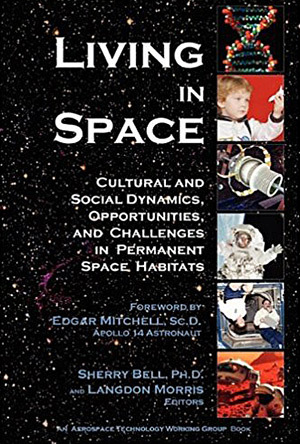 Another segment that I found very fascinating was Chapter 13, “Antimicrobials and Long-Duration Space Flight.” The persistence of microorganisms in enclosed environments will require very demanding methods of control. NASA has already found this to be a problem on the ISS and it could be a critical aspect with respect to the unmanned landers on Mars that may already have contaminated the red planet. A few chapters move tangentially from the main theme and present the commercialization and industrialization aspects. Chapter 11 “Strategic Implications of Energy from Space” covers the generating of electrical power for the Earth. It includes some very eye-opening statistics and observations regarding the various current and potential sources of energy. The author of this essay believes that Helium-3 can be economically mined from the Moon for a fusion industry that could be “realized in the next ten to forty years.” This despite the fact that the fusion visionaries have been telling us (for the past forty years) we are only ten years away from demonstrating a fusion reactor. Note too, that the quantity of Helium-3 needed can be generated on Earth for far less money than bringing it back from the Moon. Thus, with a few stretches in credulity, the book provides some possible answers for those left on the planet when the exodus to other worlds takes place. With respect to the question of “why must humans venture into space,” a very timely chapter discusses the shortcomings of the Bush Administration’s Vision for Space Exploration. This also has some astute observations about the role that NASA has played and should play in the future of space flight operations. Here, and in two other chapters, the key factor in developing commercial, industrial, and migratory missions is the creation of a viable and cost effective space transportation system to low-Earth-orbit—a reusable launch vehicle. This discussion will send the reader in a time warp back to 1972. Don’t look for the ideas presented to answer your questions about what ‘might be’ as the authors generate as many questions as they are attempting to answer. However, one statement in Chapter 7 reminds us that “the construction of a social environment is just as important for survival as construction of the physical environment”—a statement that applies equally to those of us who will remain on this planet. Living in Space is a challenging book with all that it offers, but it does require some effort to read.